Description Lively students' city (30% of its population are students) with one of the biggest universities in Europe.. Its cosmopolitan and friendly atmosphere provides a stimulating environment for learning Spanish and to experiencing Spanish lifestyle and culture.Cultural capital of Europe in 2002. 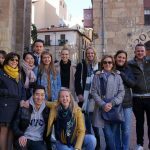 Salamanca is the perfect place to learn Spanish. It has a long tradition of offering Spanish language courses to foreigners. Many say Salamanca is the most beautiful city in Spain, largely because of her splendid Roman architecture. It is for this reason that Salamanca is on the UNESCO list of world heritage sites and holds Europe’s cultural capital award for 2002. Salamanca, is home to one of Europe's oldest universities. Its cosmopolitan and friendly atmosphere provides a stimulating environment to learn Spanish and experience Spanish life and culture. It is often said that Salamanca has something to offer everyone.